If you are thinking to own a viral website like Buzzfeed, but you don’t know how to create it, there are some ready made scripts and templates in the market. You just need to purchase it and install it on your hosting. It is easy stuff. Here, I am writing review on Buzzy php viral script (buzzfeed clone). Among these available scripts and templates in the market, I would like to recommend one script to you. It is called Buzzy. You can purchase it on Codecanyon. There are two packages of Buzzy available on Codecanyon. The Basic package of Buzzy includes News, Viral Lists, Polls and Videos features and which is costed at 36USD. But if you also want to have Quiz features, you can buy Buzzy Bundle and which will cost around 55 USD. This script offer similar features to Buzzfeed. It is like a buzzfeed clone as it’s layout is very similar to Buzzfeed. Installing of the script is very easy, there is a guide included in the purchased package. It’s admin panel is well constructed, even there is a place to crate sitemap for google search console. With it’s basic package, you can create news, viral list (which is the one I am using most), video and Pools. Viral list is really useful to make your content viral. It also offer website users to create their own contents (Actually it is content sharing platform), admin has the feature to control and manage user generated contents. If you don’t want to allow user contents, you can set admin approve option. I have been using this script since March, and I haven’t got any problem with it. You just need a good hosting to handle your traffic if your content goes viral. 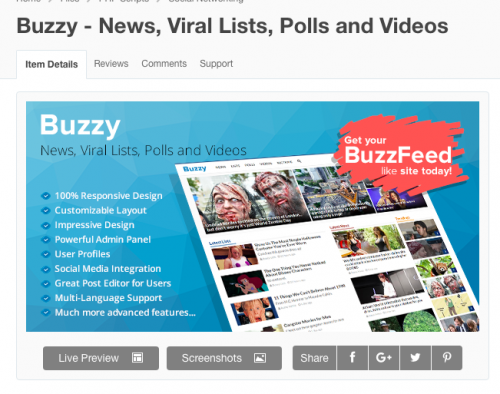 If you want to run a viral content platform, Buzzy is the one you need to consider to try it. Here is my website (www.myanbuzz.com), but it is in our language. As far as I have experienced with viral script, this is one of the best script to make your content goes viral. And it also offers quiz feature, which is one good reason to consider to use it. If you have a question about Buzzy, you can drop comment under this post. I will respond it.